The story goes about a little boy who grew up on a farm, always wanting a pair of cowboy boots. His parents, though, were very poor, and could not afford to buy them for him. One day his wealthy cousin, who lived in the city, came to visit. The city boy said he had just received a new pair of boots for his birthday, and he brought his old pair for his cousin to have. They were beat up and old, but the little farm boy tried them on, and they were just the perfect fit, and he would be proud as a peacock to have those old boots. However, the two boys decided to take a hike through the pasture, and the cousin wanted to wear the boots one last time. As they went on their walk, they came to a puddle of water, and the boy splashed, and stomped and walked through the water in the old boots. When they returned to the farmhouse, they had the idea of putting the boots in the oven of the kitchen stove to dry them out. It dried the boots out all right, but it shrunk and shriveled them up so that they were no longer good for anything, but to be thrown away. The little boy’s father, realizing the great disappoint his son felt, took a part-time job in the feed store in the in the little town close to where they lived, saved his money, and bought the little boy a brand new pair of cowboy boots. I can’t vouch for the truth of the story, but one thing is certain, if it is true, the young boy and the old boot-maker sure had a good idea about what footwear ought to be. Cowboy boots are comfortable, stylish, and declare that even if the wearer is not a real cowboy in life, he or she is one at heart. There are cowboy boots in different styles, and variegated toe points. There are walking boots, riding boots, and, well, just whatever color or kind suit your fancy. 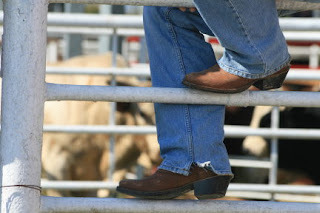 For comfort, style, whether you are a man or a woman, nothing says louder about the westerner you are at heart than a pair of cowboy or cowgirl boots.